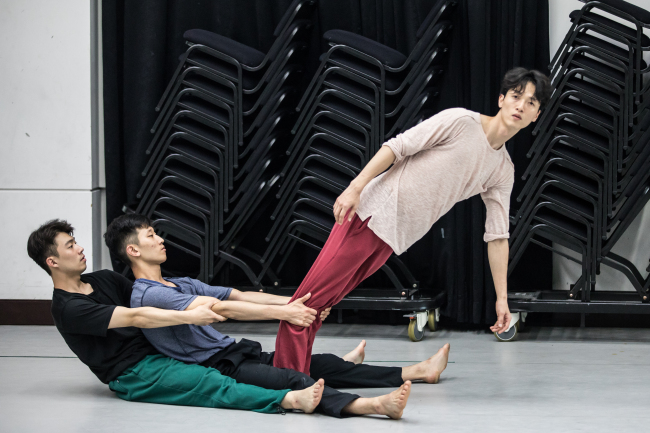 The Korea National Contemporary Dance Company will introduce the new contemporary dance works of three young local artists from Sept. 6-9 at Seoul Arts Center’s Jayu Theater. The upcoming performances are part of the KNCDC’s “Step-Up” project, dedicated to finding, supporting and developing new works of local artists. Sixty-eight works were submitted for consideration, from which three works were selected: “Until Reaching a Blank” by Bae Hyo-sub, “Aboutdance Vol. 2: Told You So” by Lee Eun-kyung and “0g” by Jeong Cheol-in. The selected works will become part of the KNCDC repertoire. “Until Reaching a Blank” is a work based on Bae’s questions about the state of dance movements and theater. Stemming from his 2015 work titled “Decomposition,” Bae’s most recent work is in line with the artist’s hopes to make better sense of the dancer’s relationship with theater. Starting with a video work that shows the decomposition process of an animal carcass, Bae’s work tries to break down commonly known dance movements and theatrical surroundings in an effort to show the archetypes of dance movements to which he has long been accustomed. Lee’ s “Aboutdance Vol. 2: Told You So“ is based on the teacher’s reports that Lee received while attending Performing Arts Research and Training Studios in Belgium, led by legendary contemporary dancer Anne Teresa De Keersmaeker. Having collected spoken words that other dancers have received throughout their careers, Lee’s performance shows the relationships between different languages as well as between verbal and nonverbal languages. Jeong’s “0g,” as the title suggests, focuses on the relations between dance and one of most fundamental forces that rules body movements: gravity. Developed from his earlier work based on the Greek mythology of Sisyphus, Jeong’s upcoming performance will highlight dynamic movements. Established in 2010, the KNCDC is Korea’s only state-funded contemporary dance company.